No need to grab your passport just yet; we've put together a list of the seven Icelandic skincare products you'll want to know about. Maybe it's just us (or our incessant celebrity Instagram stalking practices), but Iceland seems to be having a moment as of late. It seems like every time we log onto any social media platform, we come across countless pictures of either a Kardashian or a high school friend living it up in Reykjavik. The land of Bjork also has its fair share to offer in the skincare category—by tapping into the rich properties of plants and ingredients able to grow in the harsh climate. Under-the-radar brands like Bioeffect, Hannes Dottir, and Skyn Iceland prove to have some of the most hydrating formulas around, and are getting regular play in our winter skincare arsenal. 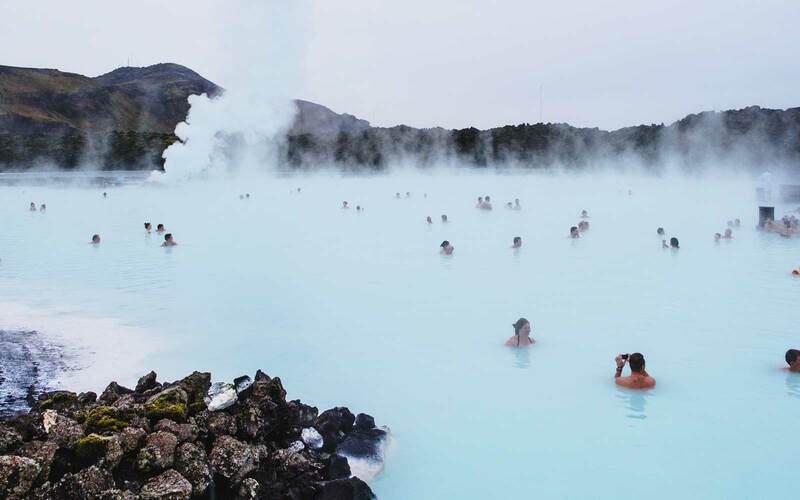 People travel from all over the world to take a dip in the Blue Lagoon's natural hot springs, but where your frequent flier miles fail you, the Blue Lagoon Algae Mask picks up the slack. With algae sourced from the geothermal waters, a thin layer imparts a radiant finish in roughly 10 minutes. What do you get when you cross a cold cream with a face wash? The Hrein Lotion Cleanser, of course, which effectively breaks down makeup without stripping your skin of its much-needed natural oils. Fact: we all need slightly thicker skin as we age—and this isn't in reference to your friends roasting you too hard and hitting your insecurities. With barley growth factor as the base for the formula, the hero ingredient mimics proteins in your own complexion to thicken skin, resulting in a glowing, line-free appearance. The Atlantic cod-derived enzymes essentially act as Uber for ingredients like hyaluronic acid and collagen, allowing the actives to quickly travel into the deeper layers of skin. You only need a few drops to feel the nourishing camelina and sunflower oil blend at work—wear it solo and allow your skin to drink in the magic, or mix it in with your favorite moisturizer increase its hydrating qualities. This all-natural blend goes in like a lamb on even the most sensitive skin types, but reveals its lion-esque power to both hydrate and gently exfoliate on contact with your skin. Related: What Is Your 2017 Food Horoscope? This comprehensive kit includes everything you need to boost radiance and hydration, even in the dead of winter, by harnessing the power of Iceland's antioxidant-rich seaweed and herbs. The night serum in particular is one of our favorites, with its ability to repair broken collagen fibers while you sleep.